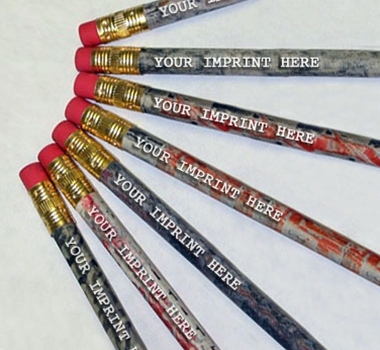 Newspaper pencils are available with your own custom imprint! Get TreeSmart’s 100% Recycled Newspaper pencil with your logo or custom imprint. Please email us at sales@theultimategreenstore.com for a quote. TreeSmart’s Pencils made from 100% Recycled Newspaper are completely tree free. TreeSmart has developed a process that essentially “turns the paper back into wood” making the pencils just as hard and solid as wood. The barrels of these pencils are tightly rolled from torn strips of “yesterday’s news”! They write smooth and consistent, sharpen easily, and support recycling. Fonts, colors and artwork of many types can be accommodated. Custom PMS colors and designs are an additional $30.00 charge. Basic ink colors include: Green, Black, Blue, Red, Maroon, Brown and Purple. Please write to sales@theultimategreenstore.com to order and arrange your custom imprint.